New Awesomeness from Amigo Comics! An age of peace. The North was finally changing. Seaports were opened to trade, new settlements flourished… Until a horde of callous warriors joined to lay waste to the northern lands, claiming that all foreigners must die… and that the Ghost Wolf is with them! But Mara, the last warrior taking the mantle of the demigod, has other thoughts! The acclaimed miniseries Ghost Wolf from award-winner writer El Torres thunders its way to comic shops with a new story arc! 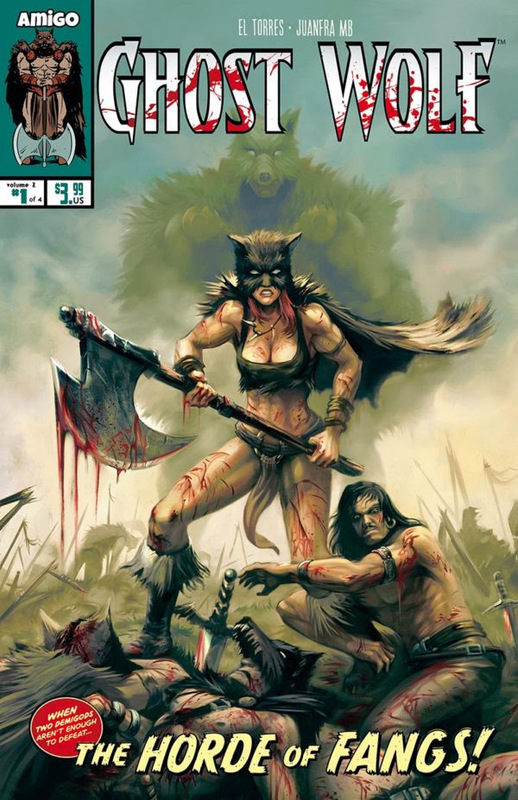 A bloody and vengeful epic saga that all sword-and-sorcery aficionados must read, with the spectacular art by new talent JuanFra MB! Ghost Wolf has received a “Spotlight On” from Previews! Somewhere in the city slums, Street Tiger wakes up, not even remembering how he survived the explosion and the brutal beating from Egghead’s goon, the Shark. Meanwhile, at the city suburbs of Barrio Crema, what seems to be a drug deal takes place. But as always happens in Nam City, nothing is what it seems! With an original graphic style, Spanish creator Ertito Montana brings the action of every pulp, exploitation movie, plenty of martial arts, callous gangs and skull-breaking bats! Street Tiger is back to work, but this time he isn’t alone! After his failure taking down the Crime Lord Egghead, the Nam City vigilante enlists the help of the deadly Black Dove. Don’t miss the last issue of this head-busting, knuckle-cracking, exploitation comic by innovative artist Ertito Montana! Artists: Ángel Hernández, Luis Czerniaswski, Siku, Loren Lorente. Read here the full saga of the Ghost Wolf, the spirit of vengeance of the Northern Wastes. When the clan of the Sons of Corr lost their courage, they were swept by the wild tribes. But there was one man decided to fight… and paid with his life. He will become the vessel for the long, forsaken spirit of vengeance… The Ghost Wolf!